Audio-Technica AT-LP60XBT review | What Hi-Fi? This isn’t the first Bluetooth turntable we’ve tested, nor will it be the last, but there was still a moment when walking round the What Hi-Fi? listening room with our wireless headphones on, that it struck us: this is all we need now for a fully-fledged vinyl system, and there aren’t even any wires. Of course, the technology being available and it being worthy of our investment are two entirely different things, but that simplicity and greater accessibility to vinyl can only work in this Audio-Technica deck’s favour. It is undoubtedly cheap. For only £179 ($149), the AT-LP60XBT will offer you a built-in, switchable phono stage as well as its wireless connectivity, and do pretty much anything for you at the switch of a button. In fact, it’s almost like using a CD player. With the size and rotation speed of the record set, all you need do is place it on the platter and press the start button. The Audio-Technica takes care of the rest – including returning the tone arm to its original position at the end. It spins at 33.3 or 45rpm, but this deck doesn’t like 10-inch discs regardless of speed, so playing those can be a struggle. But if the AT-LP60XBT plays like a ‘my first turntable’ – and we mean that as a compliment to its ease of use – it also feels like one. While its price tag dictates we shouldn’t expect high-end build, we’re struggling to think of another product around this price that feels so cheap. The near total use of thin plastic makes the deck ridiculously light. It isn’t that it is poorly built, only that the choice of material certainly doesn’t make this a nice product to use, and leaves us feeling shortchanged in terms of value for money. Even the counter weight is just plastic moulded to the end of the tone arm. 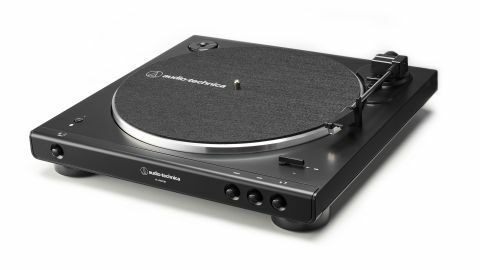 But forget this is Audio-Technica, which we know is capable of making some incredible-sounding, feature-packed budget turntables, and it is actually quite a shock to hear how capable the AT-LP60XBT is musically. Having put the platter in place – the only thing Audio-Technica asks you to do for yourself – you’re presented with an entirely coherent presentation, where the music hangs together as well as you might expect at this price, even without those costly bonus features. Timing, while not entirely spot on, is truly admirable, and there is enough dynamic range to offer an entertaining rendition of the records we spin. It is seemingly the most difficult aspect to nail, given the number of hi-fi components of all stripes we hear struggle with it, but the AT-LP60XBT proves again its manufacturer’s talent for getting it right. Balance, too, is fine. It doesn’t dig exceptionally far into bass frequencies, but it is far from lacking, and there is no coarseness to the treble as is often the way with budget components. That temptation to sound overly warm is nicely eschewed. The most limiting aspect of the AT-LP60XBT’s presentation, though, is its level of detail. It isn’t particularly insightful when playing more intimate acoustic tracks or sparse ambient productions, but has real trouble when arrangements are decidedly denser. It is as if there is finite space in which a piece can work, and as more elements are squashed in, it becomes more a block of sound than something where lines are audibly picked out. Often the percussion gets lost towards the back of a mix, which also leads to a loss of drive and rhythmic intensity. The built in phono stage might shoulder a fair amount of the blame – it seems less of an issue when we use our Bluetooth headphones or a wireless speaker – but that is one of this deck’s main selling points. Value for money deteriorates further if it requires a separate component to get it working at a more respectable standard. Three stars may appear harsh for a budget product offering so much in the way of functionality. If you were buying it based on price and features alone, it would be good value for money, but the AT-LP60XBT just falls short of our being able to recommend it to those semi-serious about their vinyl. This is by no means the worst entry-level turntable we’ve heard, but sadly it doesn’t quite reach the standard of many previous Audio-Technica attempts.